N.C. Policy Watch is chatting with some of the newest members of the N.C. General Assembly to offer a bit more insight on who they are and what they plan on doing this session in Raleigh. This will be an ongoing feature, with the goal of profiling all the new members. Haven’t been contacted for your profile yet? New legislators can contact reporter Sarah Ovaska at sarah@ncpolicywatch.com . Why’d you run for office? “Education is the reason why I decided to run. “ concerned about cuts, changes to education that are not giving teachers the resources they need to teach. What is one specific issue that you’ think needs addressing? “I’m concerned we’re going to lose the best and brightest teachers” from effects of budget cuts, low pay and increased workloads as the state pushes towards core curriculums. How do you feel about these issues? Immigration? (Does the state have a role?) “While it’s a federal issue, I’m glad they (Department of Transportation) decided to go ahead and allow the drivers licenses” for undocumented immigrants who came into the country as children. Who has influenced your politics? Her father. Her family watched the nightly news growing up and routinely discussed the political and policy issues that came up. Also former state Rep. Joe Hackney and former state Sen. Bob Atwater, both Democrats from the Chatham County area that supported her candidacy. Moderate on fiscal issues and liberal on social issues. 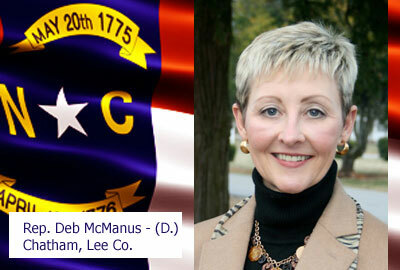 McManus is also a registered member of the Eastern Band of the Cherokee Indians, and spent her summers as a child with her grandparents who lived on the Cherokee reservation in Western North Carolina, according to her campaign website .